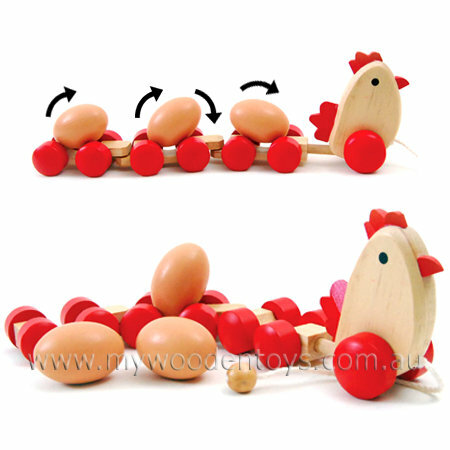 Pull Along Wooden Chicken & Eggs is a fantastic creation which combines a hen, train and turning wooden eggs. This chicken has lovely red wooden wheels and three removable carriages with three removable wooden eggs. As you pull the chicken along the wheels make the eggs rotate. This is a very clever little toy and combines trains, chickens and eggs... what more could you ask. We like this because: "Very well thought through toy."